Do not use this rack as a seat. Do not exceed the fender rack weight capacity. Using as a seat or exceeding this capacity could cause handling problems, which could result in loss of control and death or serious injury. Fits '06-later FXST, FXSTB, FXSTS, FLSTFSE2 and '07-later FXSTC, FLSTF, FLSTFB, FXSTSSE/2, FLSTSE/2/3 and FLSTSB models with Rigid or Detachable Sideplates and Sissy Bar Uprights. 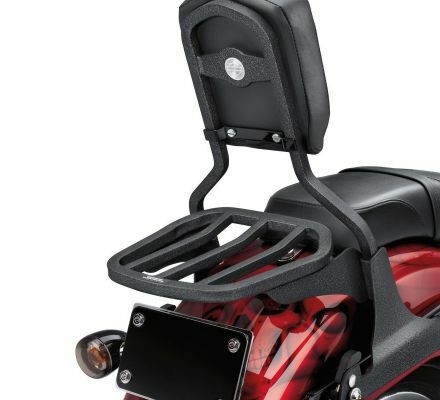 '07-later FXSTC models require separate purchase of Fender Mounted Seat.